Do Lower Cost Improvements to Address Congestion Lead to More Crashes? An analysis of crash data revealed that congestion-related improvements implemented on I-35W in the Twin Cities did not introduce additional safety risks. When installed strategically, improvements like priced dynamic shoulder lanes can alleviate congestion and improve safety for motorists. “Rather than just conducting a before-and-after analysis of crashes, we also wanted to compare the expected crash rate based on changes in traffic conditions,” said Brian Kary, Freeway Operations Engineer, MnDOT Metro District. “Probably the most significant finding was that rear-end crash risk shows an inverted U-shaped relation to lane occupancy,” Gary Davis, Professor, University of Minnesota Department of Civil, Environmental and Geo-Engineering. Davis served as the study’s principal investigator, and Kary was the technical liaison. A PDSL automatically changes status based on traffic conditions. The diamond indicates that it is open as a high-occupancy-only lane. The Urban Partnership Agreement (UPA) is a federally funded program managed by the Federal Highway Administration to explore ways to reduce congestion on urban freeways. The Twin Cities area was one of four urban areas selected to test several innovative technologies through the UPA. These included high-occupancy toll (HOT) lanes, engineered revisions to ramps and auxiliary lanes, and a priced dynamic shoulder lane (PDSL) system on segments of the Interstate 35 West (I-35W) corridor. Work on implementing these innovations in the Twin Cities ran from spring 2009 through fall 2010. MnDOT may decide to incorporate selected innovations, including the conversion of bus-only shoulder lanes to PDSLs, in other corridors. Decision-makers needed to better understand the safety-related benefits associated with the UPA improvements. The goal of this project was to compare the incidence of crashes occurring on I-35W before and after implementation of the UPA improvements. Researchers wanted to determine whether any increase in crashes was due to the installation of the PDSLs or to other changes in the transportation network. Researchers started by compiling data files on variables such as traffic volume and lane occupancy, weather conditions, and the presence or absence of UPA improvements for the relevant portions of I-35W. A second set of data was prepared using the Minnesota Crash Mapping Analysis Tool (MnCMAT) to identify crashes that took place on I-35W from 2006 to 2008 and from 2011 to 2013, the three years before and after the UPA project. Investigators established three regions — HOT, Crosstown and PDSL — and divided each region into sections so that traffic demand and lane geometry would be constant within a section. The data files were analyzed to determine the likelihood of a rear-end crash based upon the time of day, traffic volume, weather and other conditions. The analysis indicated that the increase in crashes on the most analyzed sections of I-35W was not likely the result of installation of PDSLs and other UPA improvements. A noted increase in crash rates was instead tied to reconstruction work that removed a bottleneck in the Crosstown Commons area, where I-35W shared right of way with Trunk Highway 62 (TH 62). There were some exceptions, however. 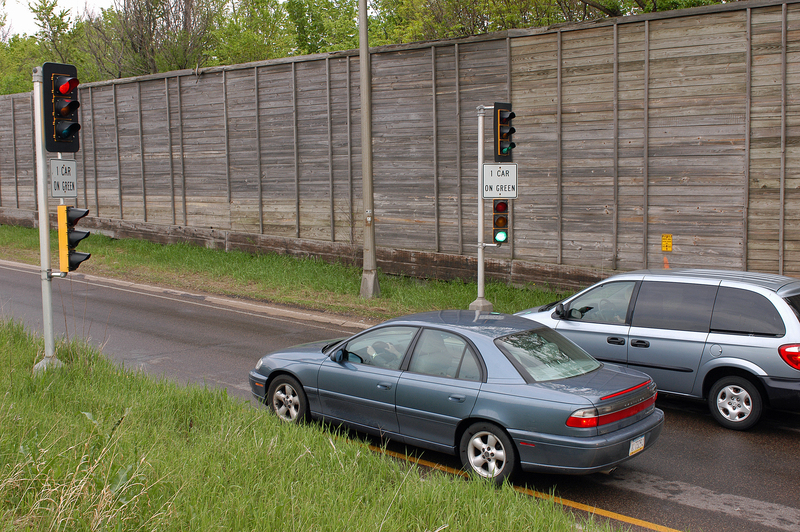 Fewer crashes occurred on a section of the freeway south of I-494 during both study periods. An increase in rear-end crash risk north of the Minnesota River was due to weather and traffic conditions. In addition, researchers identified an inverted U-shaped relationship between lane occupancy and crash risk along several sections of the I-35W study area. The findings supported the contention that PDSLs, when installed strategically, are safe and can provide transportation departments with an additional resource for managing congestion and improving traffic conditions along the Twin Cities freeway network. Installation of PDSLs in the corridor did decrease the bottleneck at TH 62, but the improvement literally moved the problem down the road by creating a new bottleneck close to downtown Minneapolis. From the MnCMAT database, the research team found 5,545 records of various types of crashes that took place from the beginning of I-35W to the I-35W/I-94 junction during the two three-year study periods. Rear-end crashes were by far the most prevalent type of crash, with 1,513 recorded before the UPA improvements and 1,657 during the three subsequent years. Researchers encountered some challenges in preparing the data files for analysis. Careful screening of loop detector data was needed to identify questionable statistics and required a review of individual crash reports to verify crash locations. Through this research, MnDOT gained valuable insights into the impact of the UPA improvements on crash incidents along areas studied on the I-35W corridor. The methodology employed supports using PDSLs on other sections of the freeway network. This post pertains to Report 2017-22, “Safety Impacts of the I-35W Improvements Done Under Minnesota’s Urban Partnership Agreement (UPA) Project,” published in June 2017. Freeways and highways aren’t the only urban roads with traffic congestion, even though traffic management strategies have been largely directed toward improving traffic ﬂows there. So, U of M researchers have taken to city streets to reduce congestion in an innovative—albeit roundabout—way. Morris is part of a research team that aims to create a framework for testing and evaluating new urban traffic sensing and control strategies for arterial networks. The goal is to balance safety and efficiency for all users—especially in places where new types of urban transportation facilities are planned in the next few years. The team is using the 66th Street corridor in Richfield as a test bed for its research. The city, along with Hennepin County, is in the process of converting a series of signalized intersections along the route to roundabouts over the next few years. The roundabout designs also incorporate new facilities for pedestrians, bikes, and bus transit as part of a multimodal approach. Initially, the researchers sought to create a larger network of interconnected sensors and a live test bed, Morris says. But funding limitations kept the project area to approximately 10 miles of arterial roads, a portion of which will be supported by a network of interconnected traffic sensors. The research team is instrumenting major intersections along 66th Street with a reliable, low-cost, high-resolution camera mounted on a center pole and supporting electronics as the intersections are being reconstructed. The use of roundabouts has grown in the region because they cost less to build and maintain than signalized intersections, they meet the latest design standards, and they improve safety by reducing traffic conflicts. But predicting the capacity of roundabouts can be especially challenging when factoring in pedestrian traffic, uneven traffic origin-destination flow, heavy vehicle volumes, and approach vehicle gap-selection timing. In addition to creating a sensor network to obtain real-time vehicle and pedestrian data to help control traffic and keep it flowing smoothly, the researchers also are developing a traffic simulation model that includes almost all of Richfield—more than 140 signalized intersections covering 21 square miles, including the arterials. The simulation model will be used to develop and test traffic control strategies under different scenarios. Minnesota Traffic Observatory director John Hourdos is leading that effort. This research and the field deployment system are funded through a collaborative grant from the National Science Foundation Cyber Physical Systems program. SRF Consulting is the industrial partner to help design the sensor network and evaluate the system. Motorists are experiencing less delay on metro-area highways, thanks to major changes to the Twin Cities’ ramp metering system. The Minnesota Department of Transportation has reconfigured ramp meters to be more in sync with real conditions. With changes to the turn-on and turn-off criteria, the meters are actually running for a shorter period of time and are only activated when needed. Ramp meters are traffic lights placed on freeway entrance ramps that control the frequency that vehicles can enter the highway. Sensors embedded in the pavement collect the vehicle traffic data used to time approximately 440 ramp meters. Staff at the Regional Transportation Management Center, which manages the ramp meters, say the whole system is operating better because of changes that were implemented approximately one year ago (based off a 2012 study). University of Minnesota-Duluth professor Eil Kwon developed the system’s new software algorithms. In a case study of Highway 100, he found that the delay on the mainline dropped by nearly half. On northbound Highway 100, the amount of “delayed vehicle hours” — defined as the vehicle hours of traffic flow with speeds less than 45 mph — that motorists experienced dropped 48 percent during the months of October and November in 2012 when compared to the same period in 2011. During the same time period, total volume on that section of northbound Highway 100 increased by 2.7 percent, Kwon said. In spring 2013, the amount of delayed vehicle hours had been reduced by 17 percent. These results are preliminary, as additional analysis is needed to determine if these results are typical throughout the system on other freeway corridors. However, based on a personal savings of $16.50 per hour, the scenario described above represents a cost savings to motorists of $1,353 to $3,447 per day (depending on the season). That’s as much as $339,150 to $861,640 per year for just a six-mile stretch of highway. Under the old system, each ramp meter would turn on based on current traffic conditions, but the criteria to turn on were easily met, causing the meters to turn on too soon. The old system did not have turn-off criteria, allowing meters to run until a pre-set time of day. With the new system, improvements were made to make the meters respond more appropriately to current traffic conditions. The turn-on criteria were improved so that meters come on only when needed, and turn-off criteria were added, allowing meters to turn off when traffic conditions improved. The new metering system is particularly effective at reducing the number of meters operating on light traffic days. “On days like the ones leading up to Thanksgiving, where traffic may be 10-to-15 percent less than normal, instead of, say, 150 ramp meters being on at a particular time, now maybe only 50 ramp meters will be operating,” explained MnDOT Freeway System Operations Engineer Jesse Larson. Upgrades to the ramp metering system also allow for a better picture of what traffic is like at a given moment, because it’s now based on corridor density rather than traffic flow. Traffic flow is the measurement of the number of vehicles passing a given point. Using traffic flow was flawed, in that similar traffic flows can occur at different speeds. The old system couldn’t differentiate between 1,000 cars passing by at 20 miles per hour versus 1,000 cars passing at 60 miles per hour, for example. Corridor density, on the other hand, is the number of vehicles per lane per mile. By measuring density instead of traffic flow, the system has a more accurate picture of what current conditions are like on the freeway. Another bonus: ramp meters will no longer release a bunch of cars simultaneously once an entrance ramp fills up. That’s because the system can now detect the ramp filling up and release the extra cars gradually instead. Twin Cities ramp meters now turn on and off based on live traffic conditions. Newly developed software has drastically reduced the amount of time and effort required by MnDOT’s Regional Transportation Management Center (RTMC) to analyze congestion in the Twin Cities metropolitan area. Developing MnDOT’s annual Metropolitan Freeway System Congestion Report used to be a manual process that could be applied to only a portion of the large quantity of data generated by in-pavement sensors. The new Highway Automated Reporting Tool now automatically imports and cleans data to produce a report about the percentage of network miles congested during peak periods as well as three new reports on other performance measures. The tool will help MnDOT engineers and planners better develop congestion reduction strategies and determine the most cost-effective investments in the network. From RTMC’s control room, engineers monitor and manage 400 miles of Twin Cities freeway traffic using data from thousands of in-pavement sensors. “Before HART, it took months to analyze freeway performance using traffic data from only the month of October. Now engineers can quickly analyze data from any time period, significantly improving traffic planning,” said Jesse Larson, Assistant Freeway Operations Engineer for MnDOT’s Metro District Regional Transportation Management Center. The tool was developed in a MnDOT-funded study led by University of Minnesota researcher John Hourdos. Note: This article was adapted from the May–June 2014 issue of our Accelerator newsletter. Sign up for your free print or email subscription by clicking here.